The Prime Minister lays foundation stones of projects at Sindri on 25 May 2018. The Prime Minister, Narendra Modi, has laid the foundation stone of various projects worth Rs.27,000 crore at Sindri on 25 May 2018. These include: Revival of Sindri Fertilizer Project of Hindustan Urvarak and Rasayan Ltd; Ranchi City Gas Distribution Project by GAIL; All India Institute of Medical Sciences (AIIMS), Deoghar; Development of Deoghar Airport; and Patratu Super Thermal Power Project. The 2,400MW first phase of NTPC’s Patratu Super Thermal Power Project in Jharkhand is a 74: 26 Joint Venture between Government of Jharkhand (GoJ) and Patratu Vidyut Utpadan Nigam Ltd. (PVUN), a subsidiary company of NTPC which is establishing a total capacity expansion of 4,000MW. PVUNL is set to develop the project in two phases: 2,400 MW (3x800MW) in Phase-I and 1,600 MW (2×800 MW) in Phase-II, which will be developed later. This project will allocate 85% of the power to Jharkhand that will benefit the state in the long run and help in the economic growth of the region. Under the Pradhan Mantri Sahaj Bijli Har Ghar Yojana (Saubhagya) scheme, this project will ensure providing 24×7 power availability to the households. The project has salient features of Dry Ash disposable system (second to NTPC Dadri), zero liquid discharge system, Air-cooled condenser technology (only second to North Karanpura STPP) and rail loading facility for transportation of ash. The project further complies with the new emission norms with high efficiency ESP, FGD and Nox emission control systems as well. The Engineering, Procurement & Construction contract of the project has been awarded to BHEL. The commissioning of the first unit is expected by 2022 and subsequently the other two units after an interval of six months each from the preceding unit. With NTPC’s commitment towards an inclusive growth and sustainable development with special focus to improve the quality of life in neighbourhood community, PVUN is already providing clean drinking water, regular health camps and skill development of local youths in the adjoining villages. Addressing the gathering, he said the State Government and the Union Government are working together for the rapid development of Jharkhand. He said that when he assumed office, there were 18,000 villages lacking access to electricity. “We worked to brighten the lives of people in these villages and took electricity there. 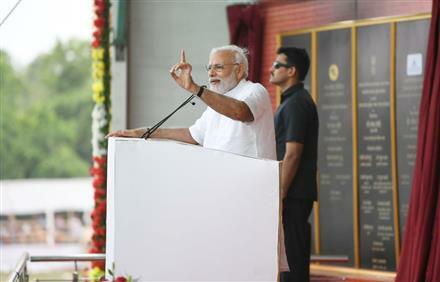 “Now, we have gone a step further and we are ensuring every household in India has access to electricity,” he said. The fertiliser plants, which had stopped working, are in the process of being revived. Eastern India will gain the most from this, Modi added. The Prime Minister said that the healthcare sector in the State will be transformed with the establishment of AIIMS in Jharkhand.